The REFUGEE community is our media that connects us with the refugee political struggles. The oppressed people of the world have their fight. Let's listen to the community! 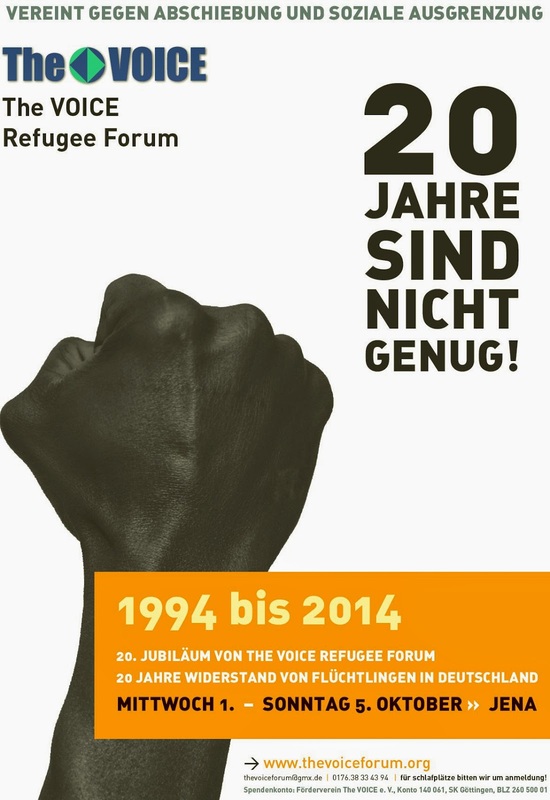 We aimed to invite participants, delegates and representatives from all the lagers to take part in The VOICE October event in Jena which is named after the foundation month of "The VOICE - Refugee Forum“ initiated in Muhlhausen-Thueringen in October 1994. In the event, there will be the presentation of "Untitled" wallpainting by the Peruvian painter Domingo Huaman, commissioned by the Caravan Festival on Colonial Injustice 2010 in Jena, as well as photo exhibitions of the Caravan Network and The VOICE Refugee activism in the „Haus auf der Mauer“, Johannisplatz Jena. There will be reports on the political situation of the refugees here in Germany and their home countries in order to coordinate decentralized solidarity actions in the quarters and lagers of refugees in Jena with Refugee community delegates reports from Jena, Apolda / Badsulza, Erfurt, Dingolfing, Berlin, Hamburg and Kiel. There will also be experimental working groups on refugee solidarity acts: There will be preparatory working groups planning with discussions on self empowerment structures through social media and networking with community meetings, music making, hiphop - political raps, poems, theaters and readings, games and arts, paintings, banners, photography and video. Cooking and food groups initiatives will empower refugee solidarity actions with food and independent donation. We uphold the mission to bring down the deportation regimes! "That refugees are free of persecutions and discrimination like the tortures, subjugations, racism; arbitrariness, absurdity and repression that accompany the regulation of the movement of people by states, particularly at borders in Germany Europe and in the western countries. We call for unconditional protection for our security and for the interest of the public to prevent and to stop the deportation:"
Refugee community delegates reports from Jena, Apolda / Badsulza, Erfurt, Dingolfing, Berlin, Hamburg and Kiel. Refugee community campaign for freedom of all prisoners in Cambodia in Jena and Erfurt. Repression of minorities and honor persecution in Pakistan. There will be preparatory working groups planning with discussions on self empowerment structures through social media and networking with community meetings, music making, hiphop - political raps, poems, theaters and readings, games and arts, paintings, banners, photography and video. Cooking and food groups initiatives will empower refugee solidarity actions with food and independent donation. Bring down the deportation regime! We can stop the deportations! What we can do more is to fight and protest the deportation and the „Dublin policies“ so that we can break the isolation of refugees. The civilization by migration is the only alternative power of the peoples' movements. There is no country on earth that exists without the history of migration. Migration and connection are legitimate resources of the people and families to connect with the global world of information and peace. It is the main driver for progress. We are all on the move! Refugee struggles against border for freedom of movement are propagated as criminal and unlawful. But: Who are the murderers in these wars against refugees and migrations? We are at war. No regime can stop migration without wars against the refugees. The election results say it is clearer that the German society is at war against the refugees and migration. But does it offer a perspective to solve any of the relevant issues of humanity, here or elsewhere? The refugee political community struggles is the only alternative movement to expose the hypocrisy of the German welcome culture and of the politicians' abuses of the fundamental rights and dignity of the refugees in order to earn racist votes. What the election has still not asked is: Who is the Nazi that people are talking about? Were there no Nazis before the election? We will ask again and again: Who is the Nazi? Who is the Nazi in the parliament? Is being a Nazi identical or cultural? Refugees are "Welcome" to Germany if you don't have opinions of being discriminated and on the war against refugees in the German society, as they continue with the propaganda of their Babylon agenda to democratize its colonial legacy or policies, so as to eleminate their inhuman crimes against refugees. . The community must rise up! Solidarity is resistance, your engagement is your power. Empower our network organizers and mobilize to defend ourselves as refugees and to protest against refugee abuses by the state authorities. Organizing and mobilizing our communities to stand up and take action for our collective values, to organize in solidarity and for justice in our communities, through the networking meetings. Solidarity is resistance, your engagement is your power. We have helped to save the refugee struggles again for a higher-impact in the community neighbourhoods with events and activities against deportation and social exclusion in Germany, especially in Thueringen and Bavaria. We gained from the redistribution of the power in concrete solidarity within the refugee communities in their localities. Building on the continuity of The VOICE Refugee Forum in our success is a long-term challenge, and we need your continuous support to be able to devote more of our resources to building long-term results. "Power up the refugee space" - Caravan Refugee Struggle. The VOICE and Caravan network will host the caravan meeting evaluation of the Open Meeting in Hamburg "Power up the refugee space" on 26/27.2017. Where more than 55 refugees / migrant activists and asylum-seekers met with also non refugee caravan activists of caravan network. Call for Network structure and meeting in the various cities of Germany with a call to refugee mobilization in the refugee localities, to be powered by community exchange. Refugee Solidarity Acts in Thueringen. And more from other cities of the refugees.